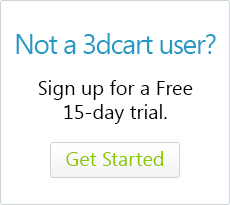 How Do I Enable Google Analytics' Enhanced Ecommerce Functions On My 3dcart Store? Google Analytic's Enhanced Ecommerce functionality allows the measurment of user interactions with your products and the user's shopping experience, including: product impressions, product clicks, viewing product details, adding a product to the cart, initiating the checkout process, and more. If you have this add-on available on your store (3dcart Pro - $229 or higher), you can use the following steps to turn it on and enjoy its tracking benefits. Look for the "Enable Enhanced Ecommerce" checkbox and place a check in it. Click "Save" at the top right of the page to confirm your settings. Your store will now track Product Impressions, Product Detail Impressions, Product Add to Cart actions, Checkout and Purchases and send them to your Google Analytics report. Just be sure to set up the appropriate matching funnel steps in your Google Analytics account.